ROTARIANS’ ELECTED OFICERS: The Rotary Club of Guam, an active organization, this week introduced its new officers following recent elections. 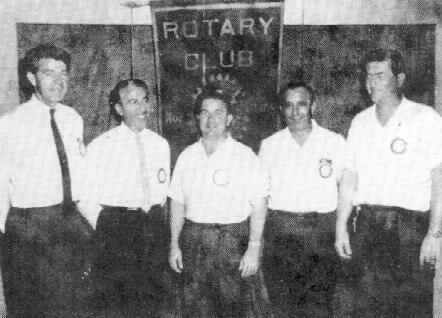 Panel of officers which shall direct and administer Rotary Club activities starting July 1 to 30, 1965, are (left to right) Gordon Mailloux, sergeant at arms; Alex M. Elias, Jr., director; Robert T. Barry, president; Josef D. Cermak, treasurer; and George R. Albrecht, secretary. Other officers but missing from the photograph are Donal O. Kenney, vice president; Tomas S. Tanaka, director and Al Carbullido, director. This administration is perhaps best remembered for PP Bob’s corner in the Rotary Bulletin entitled “Prexy Bob Sez”, as it was real indoctrination program covering Rotary information and the requirements of a good Rotarian. The picnic Jones Beach on 25 April 1965 featured events for the children of Rotarians, and the X’mas donations consisting of some 100 odd gifts having an approximate value of $5.00 each for presentation to under-privileged children were noteworthy of PP Bob’s concern for the community and, particularly, the youth. 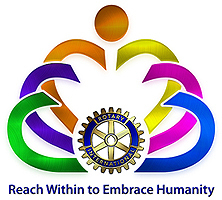 Gifts from the Rotary Club to other organizations consisted of $150.00 for the Boy Scouts, $100.00 to the Guam Tuberculosis & Health Association, $100.00 to the Guam Red Cross Fund Drive. Special events were organized to celebrate the 25th Anniversary of the club. International friendship was highlighted by the club organizing a committee to meet visiting tourist ships and to give the Rotarians on these ships the opportunity to attend make-up meeting at the Rotary Club of Guam. 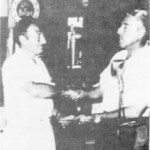 On 30 March 1965, a group of ten Australian Rotarians from the SS Himalaya made up at the Rotary Club of Guam meeting and an extract from the bulleting of 8 April 1965 reads: “By jingo, we had a bonanza time”, testifying to the effectiveness of this program. 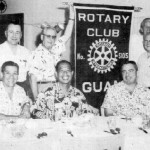 PP Bob’s experience as President of Rotary Club of Guam carried over with him when he transferred to the Rotary Club of Tumon Bay when he became President of that club in 1974-1975.